If you or your family enjoy nature, from birdwatching on a summer afternoon to stopping by a wildflower-filled roadside or walking a forest trail, why not bring nature indoors with prints by an experienced artist and naturalist. Art on your wall is more than decor to go with the furniture. When it is meaningful it becomes part of your daily life. 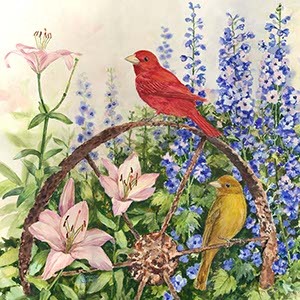 While you celebrate the quiet beauty of delicate wildflowers and shy birds with fine art, you will share your appreciation with your children and grandchildren. When art is part of the home, it becomes part of a family's memories for years to come. How well I remember the print of birds on a branch at my Grandmother's house. There was a row of birds, each one a different kind. She taught me what each kind was and when we saw a cardinal or robin in the yard I would point it out and recognize it. Decades after her passing, I still smile and remember her when I see one of those birds. I paint to explore the wildflowers and forest birds that are part of my world. I enjoy the discovery of an odd mushroom or delicate wild orchid and painting them helps me better understand their subtle beauty. I am not a gardener since I hate to pull up weeds but would rather see what kind of flowers or seeds they produce. However I have many friends who have wonderful and unique gardens and I often like to paint the flowers that grow there along with the small animals, birds or even gardening tools that I find there. Thank you for taking time to browse my Imagekind galleries. Some of the originals of the prints shown here are available for sale. Please do not hesitate to contact me with any questions or comments. More of my work is shown on my sharonhimes.com site and my Woodland Seasons blog is where I write about my part of the woods.